Clients often call us to ask how they can save money on the cost of their life insurance. Believe it or not, there are a few lesser-known secrets that can help you save a considerable amount of money on your life insurance premiums. In this article, we’ll explain a few insiders’ secrets that can help you save a substantial amount of money on the cost of your life insurance policy. The vast majority of term and permanent life insurance policies are set up to pay out as an untaxed one-time lump sum. In other words, when an insured passes away, their beneficiary will receive a check for the full death benefit of the life insurance policy. Instead of receiving a one-time lump sum, you can set up your policy so that your beneficiary receives an annual payment instead. Some of our clients actually prefer an annuitized payment instead of a one-time lump sum because it forces their beneficiary to budget the payout from their policy. With an annuitized payout, your beneficiary will receive a portion of the payout from your life insurance policy over a number of years, instead of receiving all of the money at once. Life insurance companies also prefer to pay the death benefit as an annuity because it allows them to continue collecting interest on the money they owe your beneficiary, instead of paying it out all at once. Because of this, most life insurance companies will discount the cost of your life insurance policy by up to 30% if you opt for an annuitized payout instead of the customary one-time lump sum. In order to receive discounted rates on your coverage, the policy must be set up as an annuitized payout when it is purchased. You can change your life insurance policy’s payout to an annuitized annual payment after it has been purchased, but we’ve never seen an insurance company adjust the rates. If you feel like your beneficiary would benefit from annual payments, and you’d like to save some money on the cost of your insurance, make sure you ask your agent about annuitized payout when applying. As we get older, our need for life insurance tends to decrease. Our mortgage gets paid off, our children move out, and our retirement savings have grown. Because of this, many people will not need as much coverage in 20 or 30 years as they need today. To help save you money on life insurance, you may want to consider layering two or more life insurance policies. Let’s say you’re 40 years old and you have a 20-year mortgage, and almost 30 years left until you reach your planned retirement age. Your mortgage has a balance of $500,000 and you want to purchase a policy to replace at least 25 years of your current income of $80,000 per year. In order to accomplish these goals, most agents would tell you to buy a $2,500,000 life insurance policy for 30 years. If you’re in good health, a 30-year $2,500,000 policy will cost you roughly $250.00 per month. Instead of buying one policy, you can stagger multiple policies with varying lengths of coverage. In 10 years, your mortgage balance will be about $300,000 and you won’t need to replace 25 years of income. A policy that will replace at least 15 years of your income when you’re 50 years old should be sufficient. In 20 years, your mortgage will be paid off and you’ll be less than 10 years away from your planned retirement age. At this point, you’ll no longer need life insurance to protect your mortgage, and $750,000 of coverage should be more than sufficient to replace your current income until retirement. To save money but still protect your income and mortgage, we recommend layering your coverage and purchasing a 10-year policy with a $1,000,000 face amount, a 20-year policy with a $750,000 face amount, and a 30-year policy with a $750,000 face amount. For the next 10 years when you need the most coverage, you’ll be insured for $2,500,000. After 10 years, you’ll carry $1,500,000 of coverage – enough to replace your income and pay off your mortgage. In 20 years, when your mortgage is paid off, you’ll have $750,000 of life insurance, enough coverage in place to replace your income until you retire. What is the monthly cost for a male in good health to purchase all three policies? In this scenario, layering your life insurance policies will save you more than $47,000, that’s a 50% savings on the cost of your life insurance! Best of all, you can apply for all three policies at the same time with only one medical exam. As we mentioned in our last example, most people need less life insurance as they get older. In light of this, some life insurance companies will actually allow you to reduce the amount of your life insurance policy after it has been active for at least 12 months. Well-known companies like MetLife will actually allow you to reduce the amount of coverage you carry every year, if needed. Having the ability to decrease your term life insurance policy can save you a considerable amount of money if you determine that you no longer need the amount of coverage you have. Some of our clients that benefit the most from this strategy are people who are purchasing life insurance to protect their mortgage, insuring their income, or purchasing life insurance to settle a divorce decree. Dave from New York called us because the courts required for him to purchase life insurance for his ex-wife. Dave is a smoker who is 55 years old, but in good health overall. When Dave got divorced, the judge required him to provide $60,000 of annual spousal support to his wife for 10 years. The judge also required that Dave purchased a life insurance policy to ensure his wife received the full settlement amount, even if Dave passed away before the 10 years was up. To stay in compliance with the court, Dave purchased a 10-year term life insurance policy for $600,000 of coverage. After 12 months, Dave will have paid his ex-spouse $60,000 of spousal support, and his need for life insurance will be reduced to $540,000. After 2 years, his need for life insurance will be reduced to $480,000…. To help Dave save money on the cost of his life insurance, we applied with MetLife (also known as BrightLife Financial) so he will be able to reduce the amount of coverage he carries every year. If we had applied with another company, Dave might not have been able to annually reduce his policy. The cost of a $600,000, 10-year life insurance policy for a 55-year-old male cigarette smoker is about $355 per month. If Dave purchased a policy from a life insurance company that did not allow policy reductions, he would be forced to pay this amount each month for 10 years, a total of $42,600! By reducing his life insurance coverage each year, Dave will be able to save more than $17,000 on the cost of his life insurance over 10 years. Every life insurance company has its own underwriting guidelines and its own rates. 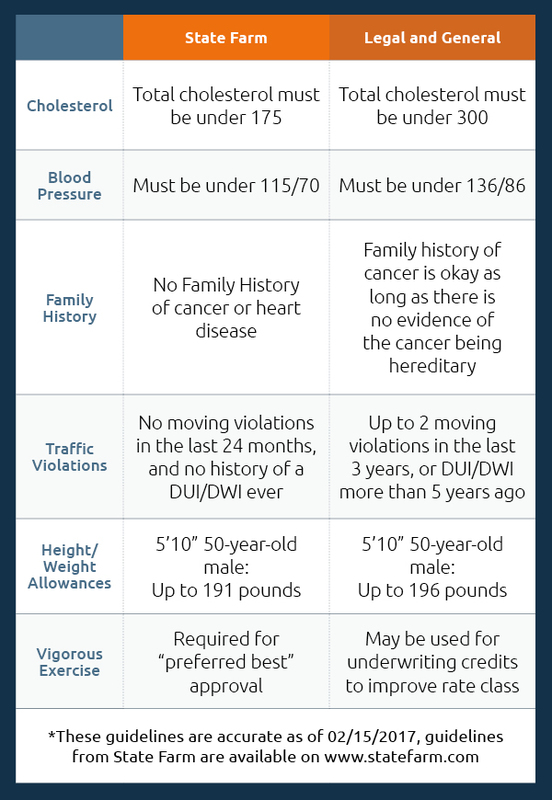 Some life insurance companies specialize with applicants in excellent health while other companies may specialize in approving applicants with an unfavorable family health history, tobacco users, people who are overweight, people with high blood pressure, or even people with serious health issues. This is why it’s so important to compare rates from at least 20-30 companies before you apply for life insurance. The local insurance agent you know probably has some competitive rates for auto or home insurance, but life insurance is an entirely different product. Companies like State Farm, Farmers, and Allstate specialize with auto insurance, not life insurance. We are able to routinely save our clients at least 30% over the cost of an identical policy offered by a company that specializes in home or auto insurance. In fact, a handful of our clients actually work for one of the companies aforementioned. Don’t take our word for it, compare rates from your local agent to a no-cost agency like us that works with more than 60 “A” or better rated life insurance companies. Hardly… Every life insurance company must play by the same rules. In order to sell life insurance, your company must be licensed on a state and national level. Every life insurance company is audited by their state’s insurance commissioner to prove that they have enough assets on hand to pay their claims. If a life insurance company cannot prove that they are financially stable, they are forced to stop selling life insurance. In addition, each insurance company practices a process of reinsurance. What this means is that if a life insurance company becomes unstable, their active life insurance policies will be transferred to another more stable life insurance company by the state’s insurance commissioner. Your policy and its benefits will not change. It’s also important to note that most of the companies that sell life insurance have been in business for more than 100 years. As an example, the company above, Legal and General was founded in 1836. State Farm was founded in 1922. A.M. Best has assigned all of the companies we represent with an “A” or better rating. In fact, both State Farm and Legal and General are considered “Superior” companies by A.M. Best. Again, another misconception. The truth is, most of the larger insurance companies barely advertise on TV and radio. An article published by the Insurance Information Institute lists the top 17 life insurance groups by revenue. State Farm, Farmers, and Allstate didn’t make the list. However, companies we represent like MetLife, Prudential, Lincoln, Principal, and Mutual of Omaha did. An article published by Insurance Business America brings to light the fact that insurance companies like State Farm and Allstate spend over $800 million dollars on their advertising each year. Guess who foots the bill? The consumers. This is why we are able to routinely save our clients more than 30% on the cost of their life insurance policies. Did you know that exercising mildly each day can help you save money on your life insurance? Some life insurance companies will offer their applicants “underwriting credits” if they exercise a few times a week. It’s important to note that we are not telling you to go out and run 5 miles a day or spend an hour pumping weights. In fact, suddenly starting a vigorous exercise routine a few weeks before you apply for life insurance can actually hurt your insurance lab results. On the other hand, going for a few walks a week, or taking the dogs to the park may be enough to bump you into a better health category. The truth is, most life insurance companies are not overly concerned with your weight, but they want to make sure you have a somewhat active lifestyle. Last month I worked with a woman who was in overall good health, but she was considered to be about 40 pounds overweight. She wasn’t a marathon runner or an Olympic-caliber swimmer, but she did walk her dogs for a few miles a couple times a week, and this was enough to get the life insurance company to offer her their 2nd best rate class, “preferred.” Without her exercise routine, she would have likely been approved at a “standard” rate class because of her weight. The improvement of two rate classes saved her more than 40% on the cost of her life insurance policy. It shouldn’t be a surprise that quitting cigarettes will save you money on your life insurance. It’s no secret that smoking cigarettes isn’t the best thing you can do for your health, and the life insurance companies don’t feel any different. 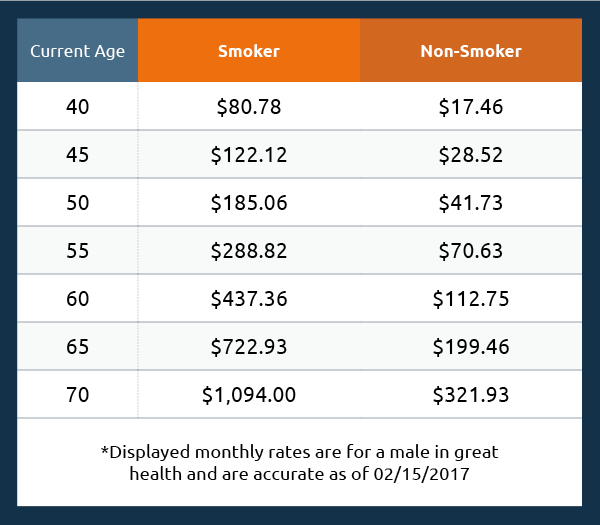 Life insurance rates for a healthy non-smokers are a fraction of the cost of an identical life insurance policy for an applicant that smokes. Although most people already know that smoking cigarettes will cause your life insurance rates to go up, most people don’t realize how much more a smoker pays for their life insurance than a non-smoker. If I quit smoking today, how long do I need to wait before I can qualify as a non-smoker? Many people mistakenly believe that they can qualify for non-tobacco life insurance rates the day they stop smoking cigarettes. Unfortunately, this is not the case. Life insurance companies do not consider applicants to be non-smokers until they have quit smoking cigarettes for at least one year. What if I use tobacco, but I don’t smoke cigarettes? Most life insurance companies will overlook an occasional cigar, but there are also a few life insurance companies that offer non-tobacco rates to applicants who smoke cigars, pipes, e-cigarettes, or who chew tobacco. If you quit smoking cigarettes and decide to use an e-cigarette instead, after one year you can save up to 50% on the cost of your life insurance policy. If you use tobacco but don’t smoke cigarettes, make sure you let your agent know so they can apply you with the right company. Our agency works with more than 60 top-rated life insurance companies and we’re licensed to sell life insurance in every state. Having access to dozens of life insurance companies and their guidelines allow our agents to match our clients with the best insurance options available to them. Unlike the large call centers that sell life insurance, our agents do not have sales quotas or monthly goals to meet. Our only goal is to provide excellent customer service to every potential client we speak with. Most importantly, our services are free, and there is no cost to apply for coverage. Our experienced agents work hard to make sure our clients always get the best deal available on their life insurance policy by working with 6 to 8 times the amount of companies our largest competitors do. Give us a call today, toll-free at: 855-902-6494, or request a free quote online to compare rates from dozens of highly rated life insurance companies in less than a minute.